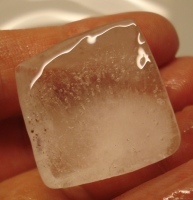 Ice Cubes are of interest to me for two reasons. 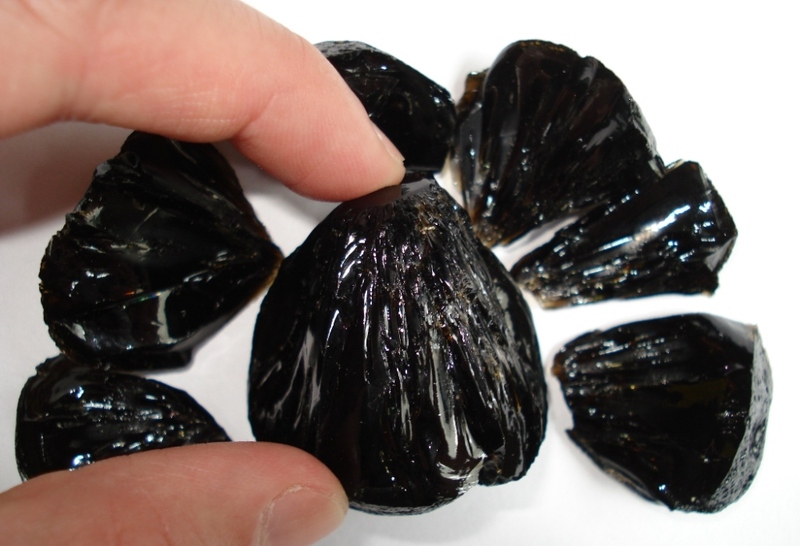 Firstly, they formed in a similar way to tektites - solidifying/freezing from the outside, towards the center. See the images below, where the radiating structure is highlighted by trapped bubbles of air. One must remember, however, that when ice freezes it expands, whereas glass contracts. 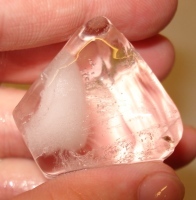 Secondly, ice cubes suffer from thermal stresses when exposed to dramatically different temperatures. 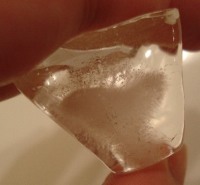 This results in cracking when you put them in your G & T, hopefully I'll get some good images soon. 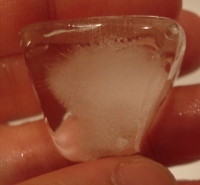 ABOVE: Ice cubes with a radiating structure, as shown by trapped bubbles of air. The ice formed by cooling from the outside in. Tektites formed in a similar manner, with their silicate melt also cooling from the outside in. Both bodies cooled from the outside-in. Trapped gas was forced towards the cooling center of the body. ABOVE: A broken tektite. 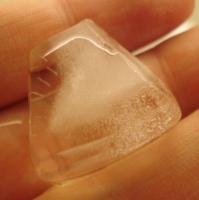 This tektite shattered during cleaning and was not dropped. Note the radiating structure. ABOVE: Anda Sculpture with a radiating pattern. Anda sculpture is a consequence of chemical etching in the ground. Is the radiaiting pattern related to the internal structure, formed by the tektites cooling history? Tektites can be quite prone to fracture, particularly in the process of cutting, due to internal stresses caused by rapid cooling. A possible way to improve the chances of success is to anneal the glass prior to working on it. This would involve very slowly heating the tektite up and then cooling it down over long period of time. Man-made glasses are always annealed in order to reduce internal stresses and improve strength.